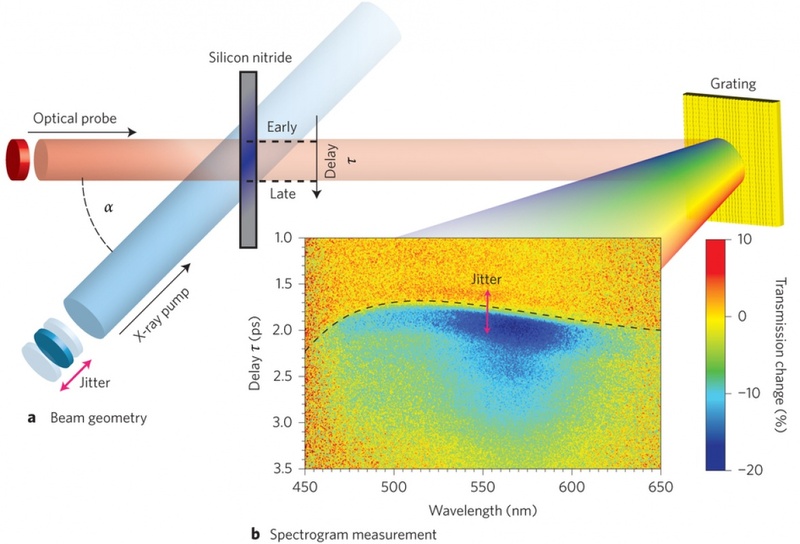 Today’s brightest coherent X-ray sources, X-ray free-electron lasers, produce ultrafast X-ray pulses for which full-width at half-maximum durations as short as 3 fs have been measured. There has been a marked increase in the popularity of such short pulses now that optical timing techniques have begun to report an X-ray/optical delay below ∼10 fs r.m.s. errors. As a result, sub-10 fs optical pulses have been implemented at the Linac Coherent Light Source (LCLS) X-ray beamlines, thus warranting a push to reduce the error in X-ray/optical delay measurements to the 1 fs level. Here, we report a unique two-dimensional spectrogram measurement of the relative X-ray/optical delay. This easily scalable relative delay measurement already surpasses previous techniques by an order of magnitude with its sub-1 fs temporal resolution and opens up the prospect of time-resolved X-ray measurements to the attosecond community.